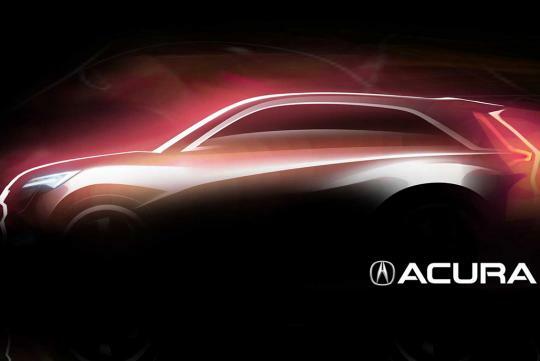 Acura, the luxury division under the Japanese automaker Honda, has released an image of a new concept vehicle prior to the 2013 Shanghai Auto Show. From the image released, the concept vehicle is seemingly a crossover. Acura had mentioned that the concept will debut for the first time in the world at the automotive exhibition that will take place later this month in Shanghai, China. Unfortunately, apart from that and the image, the automaker has yet to reveal any other details, such as engine specifications and interior features. The concept is likely to create a new market segment, considering Acura has recently launched the 2013 all new RDX and the 2014 MDX. Judging from the tyre sizes in proportion to the car's body in the image, it seems that this new concept vehicle from Acura will be a compact crossover. If so, it'll potentially compete against the BMW X1, the Audi Q3, the Mercedes-Benz GLA-Class, and the Lincoln MKC, the latter two of which are going into production soon. It seems that Acura won't be the only one previewing a new concept vehicle as Honda will also do the same thing. The model that Honda will likely preview is a redesign of the Honda Odyssey. Yes, although the North American version (redesigned) of the model had just recently been revealed in the 2013 New York Auto Show, Honda has actually been selling the global version since 2008. Therefore, it seems wise for the model to see a redesign of its global version soon.